It probably was their last time sitting shoulder to shoulder at a Pentagon news conference and the top civilian and the top military officer paused for a few laughs. Admiral Mike Mullen, Chairman of the Joint Chiefs of Staff, is set to retire this fall and he praised Defense Secretary Leon Panetta as "a pretty quick study" in mastering the military culture – a culture that of course has its own acronym-heavy jargon. "It didn't take you very long to figure out that BOG can actually be a good thing, that MITTS aren't something we use to take brownies out of the oven and that MANPADS aren't hideouts we find to eat snacks and watch football," Mullen said while Panetta chuckled beside him. Mullen didn't translate, but for those unfamiliar with Pentagon-speak, BOG means boots on the ground, as in the United States plans no boots on the ground in post-Ghadafi Libya. MITTS stands for Mobile Training Teams, the kind of instruction that the U.S. military provides allies around the world. And MANPADS– Man Portable Air Defense Systems–are the shoulder-fired missiles the U.S. hopes won't go astray from Libyan weapons depots. Panetta was full of praise for Mullen, thanking him for his friendship and saying his strong leadership had contributed to a stronger and more secure country. And he singled out Mullen's role when Panetta was CIA director and both men cooperated on the successful Osama bin Laden raid. 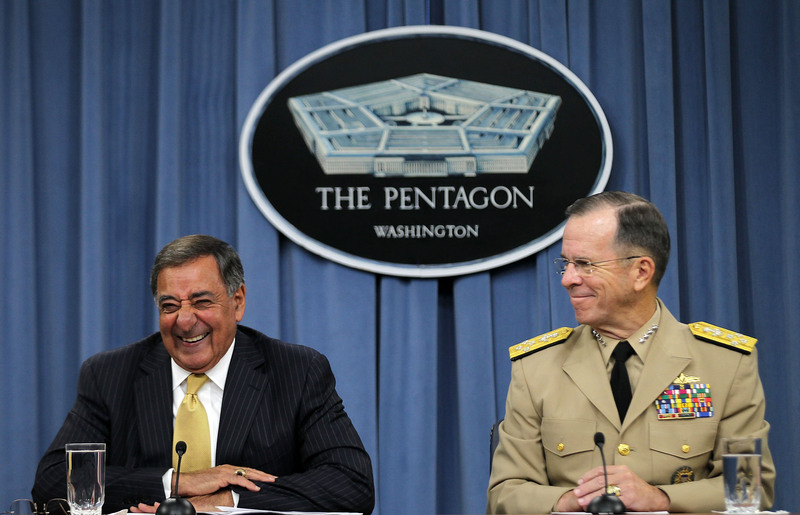 "It will be his last conference at least along side the secretary of defense," Panetta said. "We hope," said Mullen. And Panetta gave a big laugh. "I've heard that before," said Panetta. Hey CNN IDIOTS, Michael Mullen is NOT a General, he's an Admiral. Get your B.S. together you freaking retards. The photo caption says 'General' Mike Mullen? Mullen is an admiral. This from a senior CNN producer?